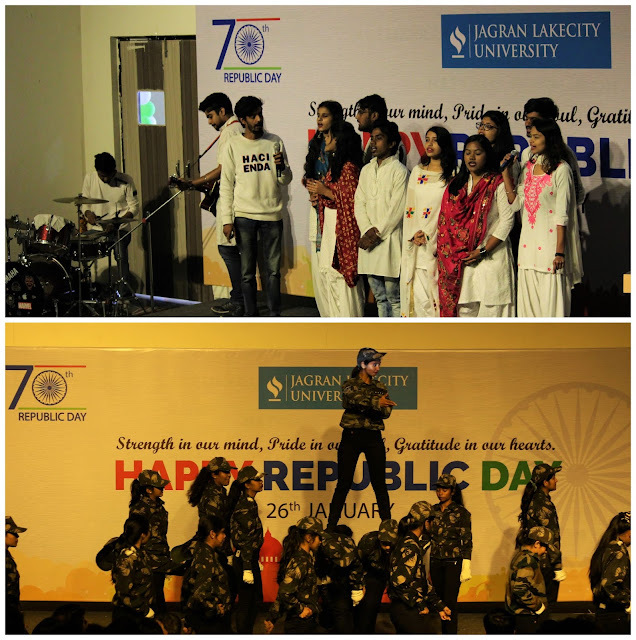 Home republic day Celebrating 70th Year in the glory of Republic India at Jagran Lakecity University! Celebrating 70th Year in the glory of Republic India at Jagran Lakecity University! 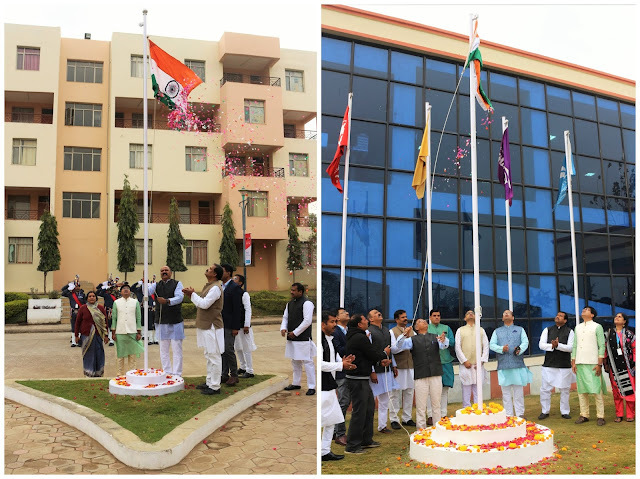 To honour the 70th year in the glory of Republic India, Jagran Lakecity University organized the Republic Day celebration packed with zeal and ardour. The morning of 26th January 2019, saw the weather full of chilly winds but the campus felt warm by the heat of patriotism whilst being adorned in tricolour. The event commenced with the guard of honour to the flag hoisting ceremony, followed by the national anthem. Dr Akhilesh Kumar Pandey, Chairman, Madhya Pradesh Private University Regulatory Commission graced the occasion as Chief Guest of the event and raised the morale of the students & staff through his words of wisdom. Furthermore, the celebrations were marked by captivating cultural performances, skits, songs and lyrical dance performances which kept the audience enthralled and engulfed in Republic day fervour. The heartfelt renditions of patriotic songs aroused feelings of love and brotherhood among all. Dr. Pandey addressed the gathering and highlighted the achievements of the college. He briefly discussed the issues that the nation is currently facing and urged everyone to unite and stand against them. Finally, the vote of thanks was delivered by Prof. R. Nesamurthy, Registrar, JLU. and the ceremony culminated with the release of tri-coloured balloons.